Most people struggle with living in the moment. It is especially hard for those who live with idiopathic pulmonary fibrosis (IPF) because they often worry about their health and what it will be like in the future. It’s easy to spend time ruminating on what life was like in the past, before IPF. Regular day-to-day distractions can become magnified by the constant struggles that come with living with a chronic illness and amplify stress. Mindfulness is a tool that is proven to help people better manage their lives and reduce stress. 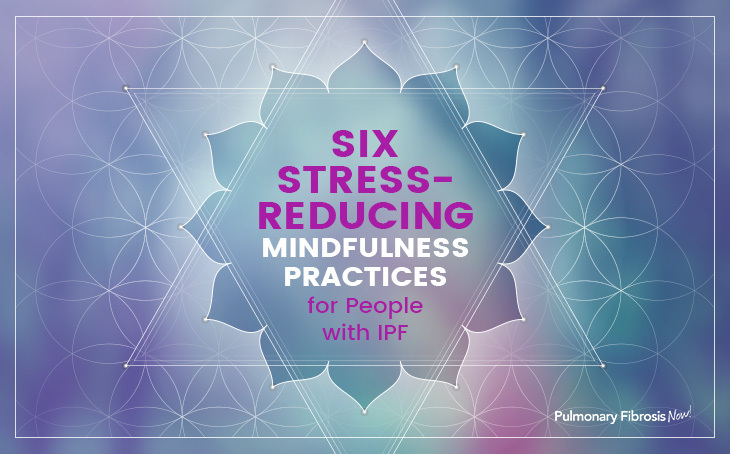 If you or a loved one are living with a condition such as IPF, take a few minutes to learn about some active mindfulness practices to reduce stress and help you feel better every day. Have you ever experienced driving your car somewhere and arriving at your destination only to realize that you can’t remember anything about the journey? Or maybe started eating a bag of pretzels and all of a sudden noticed you are holding an empty bag? Almost everyone has. These are experiences of “mindlessness,” or the state of being on autopilot. When we set our dials to autopilot, our attention becomes focused on our wandering minds, and we aren’t “present” in our lives. It’s easy to get caught up in mindlessness in this busy world but living like this can cause us to overlook the beauty in life. Mindfulness is the opposite of mindlessness, and we practice it by maintaining an awareness of the present moment. There are three simple pillars of mindfulness that are key to reaping the benefits: Attention, Intention and Attitude. Attention is the capacity of the mind to focus on the present moment. Intention is the understanding why you are being mindful. Remember the things that you care about and ask yourself what is really important to you. Attitude is your mindset about yourself and your practice. Always be patient, kind and let go of judgment. Human beings experience many emotions. They arrive, come to a peak and then pass. Feelings often only last for a few moments before they fade away, but they can be overwhelming when they are intense, and it can seem like they’ll never pass. People who live with a chronic illness like IPF feel negative emotions more often than the average person because of the daily challenges they face. They may find themselves caught up in the past or worrying about the future when their symptoms will get worse. By practicing mindfulness, you can begin to see emotions more clearly and accept that they are temporary. You can notice that emotions rise and pass and are always impermeable. Mindfulness practice will help when things like loneliness, sadness or fear arise, allowing you to accept them and respond to them in ways that are productive, rather than feeling overcome by them. Life can be difficult for people living with diseases like IPF, and it’s easy to be hard on yourself when you find it tough to come to terms with your diagnosis. It’s important for people with chronic diseases to recognize that they are feeling scared and frustrated and accept it rather than push away painful emotions and thoughts. 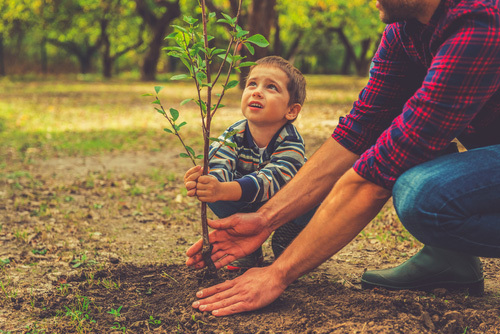 Mindfulness can help you do this and can increase a sense of joy, connection and meaning when things seem hopeless. For people living with IPF, mindfulness breathing exercises and techniques may be too difficult or could lead to shortness of breath and coughing. The methods listed below don’t require deep breathing and were included in this article with people in mind who have IPF. Any of these exercises can be adapted to fit the meditator’s circumstances or comfort level, so try a few and find what works for you or your loved one. Meditation is an exploration, rather than a fixed destination. When you meditate, you venture into the workings of your mind to fully experience emotions, sensations and thoughts. 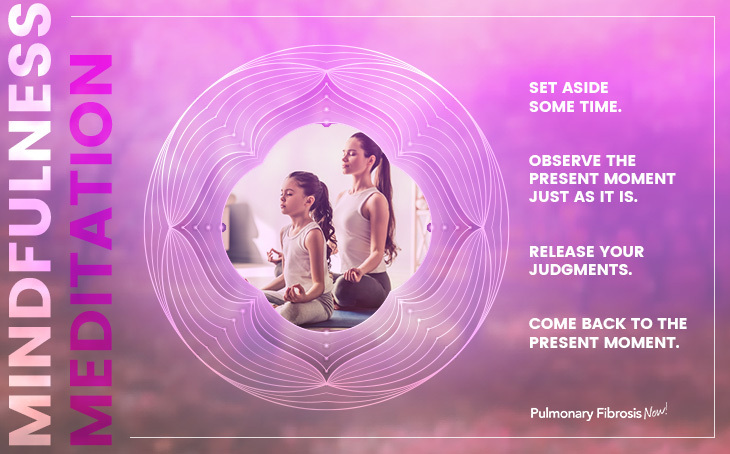 Some meditation exercises involve deep breathing techniques that could be uncomfortable for those who have IPF, but the focus on the breath is only one part of meditating. The purpose of mindfulness meditation is to focus thoughts on the present moment to achieve a state of calmness and mental clarity. Set aside some time. You don’t need any special equipment or a meditation cushion–just some quiet time in a comfortable space. Observe the present moment just as it is. The point of meditation isn’t to quiet your mind or to achieve any feeling. The goal is merely to pay attention to the present moment without any judgments. Release your judgments. When you notice yourself making judgments, take a mental note and let them go. Come back to the present moment. When your mind gets carried away with thoughts, practice returning to the present moment, again and again. That’s all there is to it. It’s very simple, but not always easy. Keep practicing. It will get easier and the results will become more powerful. Progressive muscle relaxation (PMR) is a stress reduction technique based on mindfulness that is incredibly useful for people who feel stress in their physical body. It was developed on the premise that physical relaxation is the natural result of mental calmness. It’s a natural way to release tension that has built up in the muscles due to anxiety and stress, which is something that many people with IPF deal with when they struggle to breathe. The practice is simple. Start by sitting down in a comfortable position and taking a few easy breaths. Think about what muscles are sore and deliberately tense those muscles. Release the tension and focus on the difference you feel between when the muscle is relaxed versus when it is tense. Most experts recommend tensing and relaxing muscle groups in a specific order, usually starting with the lower part of the body and ending with the chest, abdomen and face. You can practice either lying down or seated in a comfortable position in a quiet space that is free from distractions. The deliberate action and focus are a powerful way to control anxiety and stress, reduce chronic pain symptoms and relieve insomnia. A mantra is one of the oldest and most powerful tools to use in mindfulness practice. The word mantra comes from two Sanskrit words. Man means “mind” or “to think,” while tra means “protect” or “free from.” Therefore, a mantra is a tool the mind can use to become free. Some mantras have meanings that can be translated literally, but traditionally most of the value comes from the sound that the word makes. If you don’t enjoy sitting meditation, consider tying the simple practice of moving meditation or mindful walking. It is common practice in many Buddhist traditions and meditation retreats, where you alternate between periods of sitting and walking meditation. You can do it anywhere you’d like, but it’s always nice to find a location that is peaceful and allows you to walk back and forth 10 to 15 paces. Walk the paces along the path you’ve chosen, pausing to take a few breaths when you reach the end. Turn back and walk in the opposite direction, pausing again before you continue. Keep your mind focused on the action of your feet and the sensations of your heel and toes hitting the ground and your weight shifting from side to side. When your mind wanders, notice it and then focus your attention back on those sensations. The great thing about walking meditation is that you can practice it anywhere. 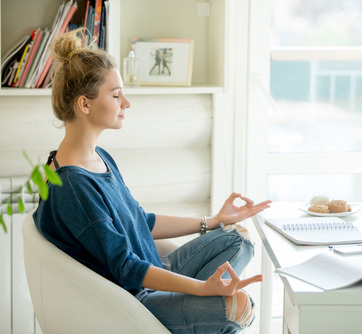 When you get up from your chair at work to use the restroom or get up for a cup of coffee, you can practice mindfulness. 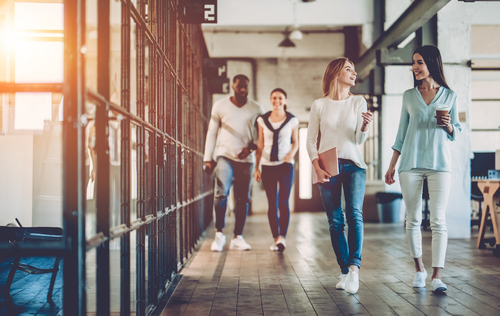 Rather than walking mindlessly trapped in your thoughts, try to bring your attention to the physical movement of walking or talking. Take notice of your how your feet feel on the floor and how the weight of your body shifts from one leg to the other. Notice your arms as they swing. Feel the temperature in the room and try to notice all the sensations in your body. Rather than sitting down to eat entirely distracted by the TV, Facebook or racing thoughts, try being aware of the eating process. Try it the next time you are eating alone. Pay attention to what is on your plate or in your hand. Feel the sensation of the fork piercing the food. Notice the way your food looks and how it smells. Consider the textures as the food passes your lips and as you start to chew. How does it taste? How does it feel? Spend a few moments being grateful for the delicious food you get to consume. Mindful eating can also be a powerful tool for gaining control over your eating habits. It has been shown to help reduce binge eating, activate weight loss and help people feel better overall. By eating mindfully, you can listen to your physical hunger cues and only eat until you feel full. It can also help you distinguish between the feeling of real hunger and non-hunger triggers that cause you to eat. It helps shift the focus of eating onto maintaining health and well-being which can be powerful for people living with a chronic illness like IPF. One of the great benefits of practicing mindfulness is that it will help you become a better listener. By practicing mindfulness in your conversations, you can focus on the other person rather than what you are going to say as a response. By merely listening and paying attention to your inner dialogue, you’ll start to notice when you aren’t present during times spent with loved ones and friends. It’s an excellent tool for seeing other people’s perspective and developing more thoughtful responses. Listening is one of the most valuable gifts that we have to give people we love. It can also help you bring your best intentions to heated situations or confrontations. Being aware of our words can be just as powerful as being aware of what is in our minds. Mindful speech involves being honest, specific and from the heart with your words. Speaking and listening with a conscious attitude helps everyone around you feel that they are heard and understood. Mindfulness-based techniques for stress reduction have been proven to help patients who suffer from chronic illness be better able to cope with the struggles of having their disease. If you or a loved one needs help managing stress, try to incorporate mindfulness into your life on a regular basis. While it’s not a magic pill, it can be profoundly life-changing. Don’t hesitate to talk to your healthcare provider if you need help with your illness, managing stress or would like to learn more about mindfulness. Give it a try and see for yourself what it’s like to live with less stress.